a group of stations (surface meteorological, upper-air, or other) spread over a given area for making regular observations. alternate bands of light and dark ice seen on a glacier surface. sea ice more than 2-years-old, up to 3 meters (10 feet) or more thick; hummocks on old ice are even smoother than in second-year ice, and the ice is almost salt-free; when old ice is bare of snow, it is blue and lacks the greenish tint of second-year ice. deposited snow whose transformation into firn is so far advanced that the original form of the ice crystals can no longer be recognized. permafrost occurring beneath exposed land surfaces. a lead that connects two open bodies of water; ships can traverse between them through this lead; it also refers to a lead where open water is found, or a lead that has not completely frozen. composed of floes seldom in contact and with many leads; ice cover 4/10ths to 6/10ths. a body of unfrozen ground that penetrates the permafrost completely, connecting suprapermafrost and subpermafrost water. a large area of freely navigable water in which floes may be present in concentration under 1/10th; if there is no sea ice present, the area may be termed open water, even though icebergs are present. ice formed in an open cavity or crack in the ground by reverse sublimation of water vapour. freezing that occurs under conditions that allow gain or loss of water by the system. a pingo formed by doming of frozen ground; caused by groundwater that moves downslope through taliks and onto the pingo surface, where it freezes. a distinct soil micromorphology, resulting from the effects of freezing and thawing processes, in which coarser soil particles form circular to ellipsoidal patterns. an organic soil having a surface layer containing more than 17% organic carbon by weight, with permafrost within 1 meter (3.3 feet) below the surface. one of a group of lakes possessing a common, preferred, long-axis orientation. any catastrophic flooding from a glacier; may originate from trapped water in cavities inside a glacier or at the margins of glaciers or from lakes that are dammed by flowing glaciers. 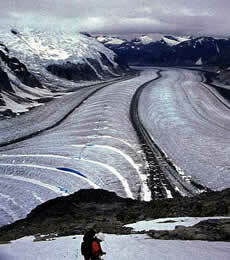 a valley glacier which drains an inland ice sheet or ice cap and flows through a gap in peripheral mountains. a nearly colorless (but faintly blue) gaseous form of oxygen, with a characteristic odor like chlorine; has a formula of O3 and a molecular weight of 48; found in trace quantities in the earth's atmosphere at all times, primarily in the stratosphere between heights of about 10 to 50 kilometers (6 to 31 miles; the ozonosphere or ozone shield) where its production results from photochemical processes involving ultraviolet radiation; its maximum concentration occurs between 20 to 25 kilometers (12 to 16 miles); in the lower atmosphere, ozone is commonly formed as a product of electrical discharges through the air. stratospheric ozone layer, giving protection to the earth's surface due to intense absorption of harmful solar ultraviolet radiation by the gas.